The A114 is constructed of welded steel plate with added thickness in many areas. It contains bronze bearings and bushings and precision ground surfaces for long life. The A114 Shear comes complete and ready to operate. 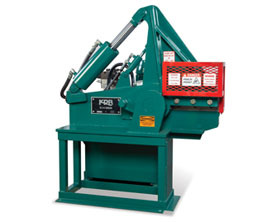 No air compressor or special foundation is required.The Shear head may be stopped or reversed at any time during cutting cycle. There is a powered hold down to clamp the bar in position for added safety. This feature frees the operator from holding bars near the blade. There is also an adjustable shear stroke. The shear will return and stop automatically at the end of the shear cycle or preadjusted opening.